Banksia burdettii is a large spreading shrub that gets to 6-8'. This flower is spent but still fascinating as a dried flower. Blooms are yellow and come on in the early spring. 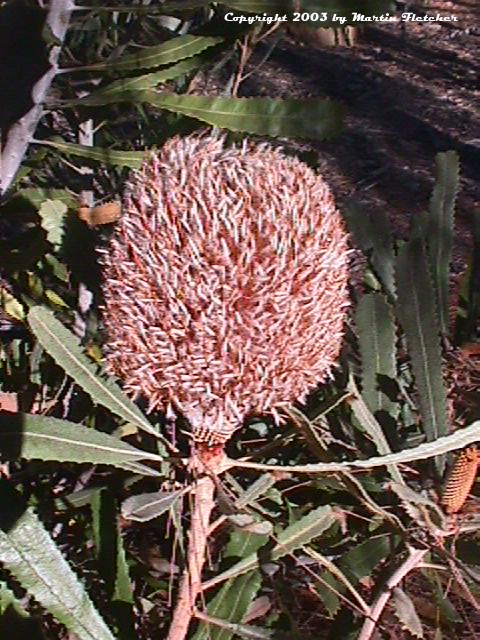 Banksia burdettii prefers sun to light shade and requires well drained soils. Once established Banksia burdettii is hardy to drought and frost. Flowers and foliage of Banksia burdettii the Burdett's Banksia.